We’d love your help. Let us know what’s wrong with this preview of The Roman Catholic Controversy by James R. White. To ask other readers questions about The Roman Catholic Controversy, please sign up. James White is a biased anti-Catholic protestant, who frankly is very confused. If you wish to truly know about the Catholic Church, and what it really teaches and believes, then why not go to the source?! The same way you'd read a book on Buddhism by a Buddhist, and not go to a Muslim for his perspective. I suggest Dr. Peter Kreeft's Catholic Christianity for starters. You may also want to read books by, Frank Sheed, Fulton J. Sheen, G.K. Chesterton, and of course Pope Benedict XVI. How I wish I could have stumbled upon this book (or one like it!) decades ago. Brilliant - and extremely dangerous. There we have people who claim to love their savior Jesus, the Bible, Heaven, God's morality, and the Church. Sounds wonderful doesn't it? Then you find out a few years later that their Jesus, Savior, Bible, Heaven, and Church are not the same as yours. These New believer's only agreed with you until they got How I wish I could have stumbled upon this book (or one like it!) decades ago. Brilliant - and extremely dangerous. Then you find out a few years later that their Jesus, Savior, Bible, Heaven, and Church are not the same as yours. These New believer's only agreed with you until they got seriously educated in their religions OFFICIAL doctrine. Nasty eh? The Big question is: Will Roman Catholic's make it to Heaven? It's a possibility - if they have a rebellious streak towards official doctrine and tradition. Sometimes being rebellious and stubborn is a wonderful thing. I have heard that Mother Teresa made some interesting stands against the Church. Sure would like to see her in Heaven - But did she love Mary, man's church traditions, and the Saints more than Jesus? I'm not sure. Did the thief on the cross make it to Heaven? Was he Catholic? OR Mormon? Most religions would most likely disagree that the thief made it to Heaven, He just didn't DO ENOUGH. It was too simple to be effective. But here goes: Luke 23:40-43..."Do you not fear God, since you are under the same sentence of condemnation? And we indeed justly, for we are receiving the due reward of our deeds; but this man has done nothing wrong. Jesus, remember me when you come into your kingdom." And Jesus said to him, "...today you will be with me in paradise." This man made it to heaven - having only a one minute conversation with Jesus. No Popes, prophets, rituals, decrees, traditions, spiritual weddings or chants, (or purgatories and indulgences.) The best thing is that everything the thief said agreed fully with the ENTIRE Bible. You can run those few verses through the entire Bible and feel assured they ROCK! Canon 5 - If anyone says that it is a deception to celebrate masses in honor of the saints and in order to obtain their intercession with God, as the Church intends, let him be anathema. "It must be held by faith that outside the Apostolic Roman Church, no one can be saved; that this is the only ark of salvation; that he who shall not have entered therein will perish in the flood." I won't even bother to get into the bits about Mary being equal with Jesus. That's just too freaky! This is a fun game for anyone: go through historical Catholic decrees and find out how often you are theologically Anathema. Then have a look at ECT (Evangelicals and Catholics together). The Catholics seem to forget these important statements given by the OFFICIAL church meetings. Weird eh? An excellent read. Although biased reviewers falsely equate disagreement with Catholic distinctives as anti-Catholicism, to read Dr. White's book proves this is not the case. White contrasts these distinctives to the Scriptures and church history in an effort to show the reader how the Roman Catholic church has strayed from orthodoxy. I highly recommend all of Dr. White's books. A clear, precise explanation of Catholicism from a Protestant perspective. I would highly recommend this book to anyone consider Catholicism or in dialogue with someone about the differences between the two perspectives. Do doctrinal differences between Roman Catholics and evangelicals matter? This book is an excellent introduction to the Roman Catholic-Protestant debate and a good resource for laymen. Dr. James R. White is a profound author, gifted debater, and effective communicator with a love for God's truth. He's debated numerous leading Roman Catholic apologists over the years and is well-informed of the issues and views of both sides. This book is a careful look at the current issues of tradition and scri Do doctrinal differences between Roman Catholics and evangelicals matter? This book is an excellent introduction to the Roman Catholic-Protestant debate and a good resource for laymen. Dr. James R. White is a profound author, gifted debater, and effective communicator with a love for God's truth. He's debated numerous leading Roman Catholic apologists over the years and is well-informed of the issues and views of both sides. This book is a careful look at the current issues of tradition and scripture, "sola scriptura," the papacy, purgatory, indulgences, Marian doctrine (e.g. immaculate conception, "latria," "dulia," etc.) and most importantly, the heart of the Gospel itself (how one is declared righteous in God's sight). This book is not based on mere "feel good, warm, fuzzy" theology, but presents the Biblical arguments well. Many Roman Catholics claim the modern Roman Catholic church today is still the same true apostolic church that was founded by Christ 2,000 years ago. But do her teachings, as she stands today, pass the test of Scripture? Or has there been an evolution in her doctrines throughout the years? Dr. White carefully quotes official Roman Catholic church documents, well-versed Roman Catholic theologians, the Catechism of the Catholic Church, and other ecumenical Councils. But most importantly, he quotes Biblical passages for each topic at hand so the reader can compare and hence discern which views (the Roman Catholic's or evangelical's?) is in accord with the Scripture. One of my favorite chapters in the book is on justification, where Dr. White beautifully and clearly explains the Biblical teaching of how one--who is inherently unrighteous--is declared righteous positionally in Christ. He illustrates that one day the Christian will be able to stand justified before the judgment throne of God--clothed not in his own supposed "righteousness," but rather in the pure spotless garments of Christ's righteousness alone. Our sins have been imputed and placed upon Christ on the cross; and in return, His righteousness are imputed (credited) to us by faith (Phil. 3:9; 2 Cor. 5:21). And while he emphasizes the biblical teaching of salvation by faith alone, Dr. White neither denies nor downplays the role and importance of good works in a believer's life. As he aptly put it: Faith alone saves, but a saving faith is never alone--it always produces good works. This was the first book that helped me to understand better the true Gospel, the nature of saving grace, my utter hopelessness & helplessness apart from God's unmerited saving grace, and the importance of relying upon Scripture alone as the infallible & sufficient source of truth on matters of faith and life. Mr. White would be correct in his assessment of the Catholic Church, if only he represented the facts as to what Catholics believe. This book is another propagation of lies and it is mind blowing that any "Christian" publisher or "Christian" bookstore supports a blatant representation of disobeying the ninth commandment. Good book on the differences between biblical Christianity and Catholicism. Probably one of the best books on the false teachings and heresies within the Roman Catholic institution. Excellent rebuttal of the Roman Catholic apologetic. Excellent, informative primer to Roman Catholic Vs protestant debate! 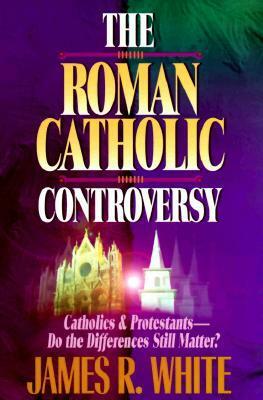 James R. White's The Roman Catholic Controversy seems oddly titled. I managed to see his idea of the controversy to be a willingness on the part of some Protestants, and even Evangelicals, to minimize the importance of the theological distance between Rome and Reformed. I would guess that those who see that as a controversy would not be in need of being convinced by this book. What the book does aim to do is put Roman Catholic beliefs logically outside of the Gospel as defined by the New Testame James R. White's The Roman Catholic Controversy seems oddly titled. I managed to see his idea of the controversy to be a willingness on the part of some Protestants, and even Evangelicals, to minimize the importance of the theological distance between Rome and Reformed. I would guess that those who see that as a controversy would not be in need of being convinced by this book. What the book does aim to do is put Roman Catholic beliefs logically outside of the Gospel as defined by the New Testament. Some of his arguments are more persuasive than others, but ultimately I feel the book lacked the ability to bring about a change of mind in someone who is more open-minded toward Rome than he. I was especially alarmed by chapter three of the book in which it states that since the New Testament speaks of a Gospel of peace, and Catholics do not believe that one can be certain of his status before God as one who is eternally secure at any moment prior to departing this earth, then the Catholic faith cannot bring peace of mind, and thus cannot truly be in keeping with the Gospel. This to me is not a solidly Biblical argument, and to initiate one's critique of Catholicism in such a less than scholarly manner does not lend much credibility to the author. He is essentially also throwing any non-Calvinist believers under the bus along with Catholics here, though he's not willing to follow his logic to the point of stating that. I also question his trust in the clarity of the Scriptures with regard to the Gospel - what is required to be saved. If it is so clear, why can so many scholarly and well-meaning people disagree about it? But to be as invested in sola scriptura as he is requires one to see the Bible as clear, able to interpret itself, and self-authenticating. His attempt to paint the Catholic view of authority as being the one truly guilty of circular reasoning seems weak. His section on the Catholic view of development of doctrine is likewise feeble, but interesting in the light of Pope Francis's teachings that appear to reverse the Church's prior teachings on capital punishment. I was drawn into reflection on this based on the article by Monica Migliorino Miller in the December 2018 issue of The New Oxford Review. If anything makes the unquestioned authority of the church seem to be a doctrine ready to topple, it is the reckless teaching of Pope Francis. And speaking of the papacy, the book seems to bring its strongest case against the theology of the papacy. White brings up several convincing points in the New Testament that would make one question this stance of the Catholic Church. I could go on. Though there are a couple good arguments he makes against the Catholic Mass as a sacrifice, he doesn't seem to deal with John 6 very convincingly. The theology of justification isn't handled well by him. He is not able to show persuasively that all the passages dealing with it are speaking of forensic justification that is imputed and not speaking of the infusion of Christ's righteousness in those who are justified. If the just shall LIVE by faith, that means a bit more than just having a legal slight of hand going on in one's heavenly accounts. He shows the weaknesses of extreme Mariology in terms of Biblical evidence against it. He also pokes a pretty big hole in some of the beliefs about purgatory. But I see two problems that make the book less than capable of warning his audience away from Rome. First, he claims that the church has authority to teach, but isn't willing to invest it with any Holy Spirit guided guarantee to be able to teach the truth. He is willing to give that guarantee to individuals, but not to the church as a whole. Secondly, I just never sense anywhere in the book that he has any admiration or love for any Roman Catholic. If I felt he were trying out of love for misguided people to steer them toward the truth, I would be more drawn to his arguments. Instead, I sense an eagerness to shoot down the tricksters who are trying to toy with his Gospel of peace. In this book, James White states: What is the gospel? What does the Bible teach about the gospel? What does Rome teach about the gospel? If there is a difference, what is it? Where does it come from? Everything else pales into significance. One of my favorite sections was in the last chapter, Sola Gratia, in a section titled "What about peace with God?" White discusses reasons to reach out to the Roman Catholic in order to become a "messenger of life" in case "he does not know the peace that com In this book, James White states: What is the gospel? What does the Bible teach about the gospel? What does Rome teach about the gospel? If there is a difference, what is it? Where does it come from? Everything else pales into significance. This book did more towards steering me towards Catholicism than any I have read in a long time. Protestants who are debating about crossing the Tiber will certainly get their bathing suits on after reading this jewel. Between White and de Sales I am almost ready to sign up. An excellent introduction to the fundamental problems with Roman Catholic theology, easy to read but thorough enough to give to a serious Roman Catholic believer. Excellent source for those who wish to learn more of Catholic theology in relation to Christian theology...good read! Very informative and concise introduction to the distinctions between Rome and Protestantism. Probably the best evaluation I've ever read on the topic. Very helpful. A must read to anyone who desire to know the Roman Catholic doctrine and his differences with Protestants. This is a good job made by James White, his read is complete worthy. I recommend this book. As a Reformed Protestant who grew up in a Roman Catholic household, I am grateful for the many good things that my Roman Catholic background gave, such as a good sense of morality and a rudimentary knowledge of the Bible. However, I have since come to know the truth of the Gospel and my desire for other Roman Catholics is the same. In witnessing to Roman Catholics, however, we need to know what exactly are those issues divide us, and why they matter. While it is uncommon, there are some Roman Cat As a Reformed Protestant who grew up in a Roman Catholic household, I am grateful for the many good things that my Roman Catholic background gave, such as a good sense of morality and a rudimentary knowledge of the Bible. However, I have since come to know the truth of the Gospel and my desire for other Roman Catholics is the same. In witnessing to Roman Catholics, however, we need to know what exactly are those issues divide us, and why they matter. While it is uncommon, there are some Roman Catholics out there who understand the issues well enough to pose a challenge when witnessing to them. Some Evangelicals have even been persuaded into joining Rome. The same might have happened to me had it not been for Dr. James R. White and Alpha and Omega Ministries. He has had dozens of exchanges with Roman Catholic clergy and apologists. This book, The Roman Catholic Controversy, is the fruit of his extensive ministry in defending the Biblical Gospel from Rome's claims. It makes the issues clear and helps to focus in on what exactly those important differences are and how to biblically defend the central doctrines of the Reformation, such as Sola Scriptura and Sola Fide. 3.5 Very solid and well researched. It was a tad dry, but I could tell an effort was made to not be. I took my time going through it and didn't find anything I disagreed with. This will be a good resource to keep for the future.